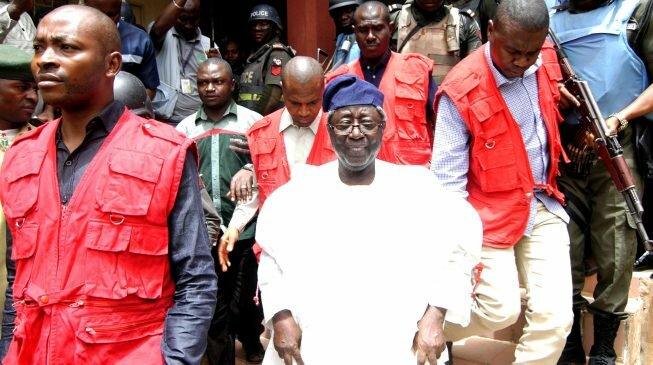 A former governor of Plateau state, David Jonah Jang has remanded in prison Custody by a Plateau state high court on a 12 count charge of Misappropriation of funds to the tune on N6.3 million. Jang, serving senator was said to have embezzled funds released to the state by the Central Bank of Nigeria two months to the end of his tenure as governor in 2015. Jang allegedly pocketed N2 billion released by CBN for disbursement to SMes in the state under the Micro, Small and Medium Entreprises developments funds, MSMEDF, just a month before the expiration of his tenure in APril 2015. “That you, Senator Jonah David Jang, whilst being the Governor of Plateau State between January and May, 2015 in Jos, within the jurisdiction of this Honourable Court, used your office as Executive Governor of Plateau State to confer unfair advantage upon yourself by collecting the sum of N4,357,195,000 (Four billion, Three Hundred and Fifty-Seven Million, One Hundred and Ninety-Five Thousand Naira) from the cashier of the Office of the Secretary to the Plateau State Government, and which sum was derived from the account of Plateau State Government, and you thereby committed an offence punishable under Section 19 of the Corrupt Practices and Other Related Offences Act, 2000”. However, Robert Clarke SAN, representing the defendants informed the court that he had a pending “bail application for the 1st and 2nd defendants”. He urged the court to admit the defendants to bail on self-recognition, saying; “the first defendant was a former military governor, two time civilian governor and currently a serving senator”. Justice Longji ordered the remand of the defendants in prison and adjourned to May 24, 2018.